Adam was born September 9, 1966. After becoming a saterday night live cast member, Sandler went on to star in many Hollywood feature films that combined have grown over $2 billion at the box office. 2003Best Kiss Adam Sandler and Emily Watson"Punch-Drunk Love"
ABOUT Adam Comedic actor whose best known films include Billy Madison, The Waterboy, Mr. Deeds, Pixels, Blended, The Wedding Singer, Happy Gilmore, Grown Ups, and Big Daddy. BEFORE Adam was famous He developed his comedic talent while attending New York University. Before breaking through in Hollywood, he worked as a comedian and appeared as a regular cast member on Saturday Night Live. Fun factIn 1999, he founded a production company called Happy Madison, a title he created from combining the names of two of his films, Happy Gilmore and Billy Madison. FAMILY He married actress jackie sandler in June 2003, and the couple had two daughters together. His daughters' names are Sadie and Sunny. 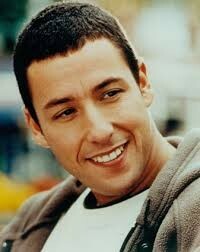 Adam sandler started off on Saterday night live.